SPACE ODDITY | Love Productions Inc. Experience Bowiemania in this amazing tribute! 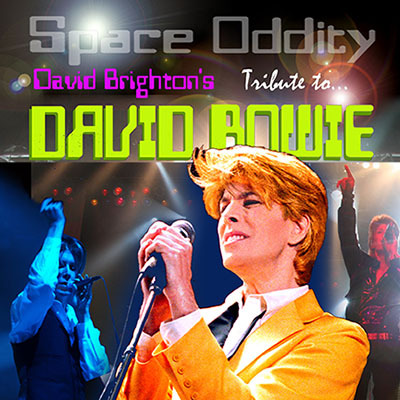 David Brighton is credited as being the world’s best David Bowie impersonator, with one of the most entertaining tribute acts ever to hit the stage. Brighton’s credits include performing side by side with David Bowie himself in the TV commercials for Vittel Mineral Water and for Reality – Bowie’s CD. The career spanning ads, in which Brighton portrays many of Bowie’s most legendary personas, have been airing in the United States, Great Britain and throughout Europe. Brighton also appeared as David Bowie on VH-1 television as well as in the concert video of international pop star Shakira’s. Other artists with whom Brighton has performed include Sir Elton John, Stevie Wonder, Devo, Kenny Loggins, Three Dog Night, Little Richard and Barry Manilow. Clients for private performances have included Arnold Schwarzenegger & Maria Shriver, Brooke Shields, Dustin Hoffman, Martina McBride, Sylvester Stallone, Jay Leno, David Foster, Catherine Zeta Jones & Michael Douglas, Barbara Streisand, Quincy Jones, Lisa Marie Presley, and Nicholas Cage.